Sunscreen is our first line of defense against damaging UV rays that can cause skin cancer and premature aging of our skin. Research has provided compelling evidence that shows daily use of sunscreen helps lower the risk of non-melanoma skin cancers, in some cases by as much as 50%. Australian researches recently conducted a trail analyzing latex impressions from the backs of subjects’ hands. After 4 ½ years they found that those adults who used a broad-spectrum sunscreen daily showed “no detectable increase” in skin aging. They also found that signs of skin aging – coarser skin and more wrinkling – was 24% less among subjects in the daily sunscreen group. 24% less! I’ll take those odds. Lower Your Risk of Skin Cancer: According to the Centers for Disease Control and Prevention, applying sunscreen daily can cut your risk of contracting skin cancer in half. Protect Your Skin from UV Rays: UV rays are primarily responsible for premature skin aging – wrinkles, sagging skin, and uneven pigmentation. Applying sunscreen daily can help to slow down the signs of aging. Protect Your Skin from UB Rays: UB rays are primarily responsible for sunburn. Getting a sunburn, even just once every 2 years, can triple your risk of melanoma skin cancer. Adding sunscreen to your daily routine has become easier as cosmetic companies have added SPF protection to primers, foundations, serums, and creams. 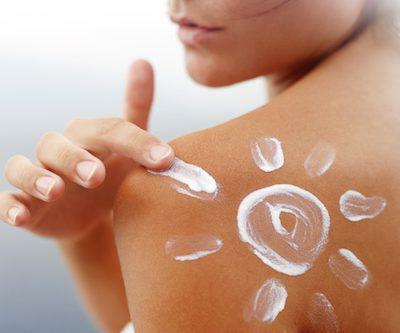 Look for an SPF of at least 15-30 so be sure to check the label before you purchase. CAN I REVERSE THE SIGNS OF AGING FROM SUN DAMAGE? While no procedure can turn back the clock 100% there are treatments that can greatly reduce the appearance of fine lines, wrinkles, and sagging skin caused by sun damage. Laser treatments for skin resurfacing and skin rejuvenation provide excellent non-surgical results with no downtime. Not sure about your options or confused on where to start? Contact our office for more information or to schedule an evaluation.